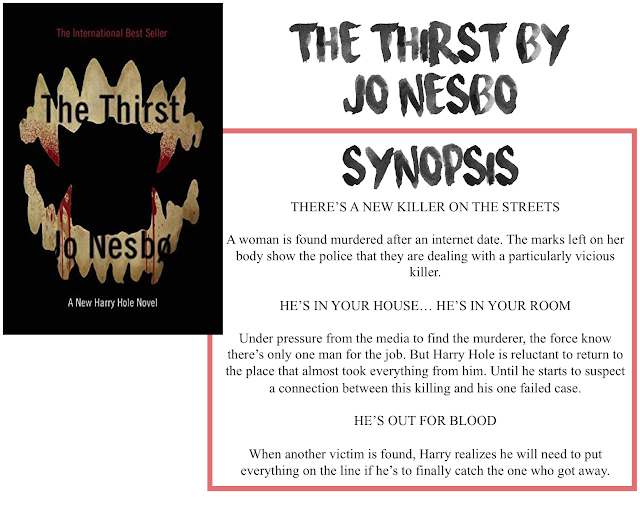 I am back with another book review, today it is book 11 in the Harry Hole series, The Thirst by Jo Nesbø. Thanks so much to NetGalley for providing me with an eARC of this book for an honest review. As always, all opinions are my own. Before I get too far into this review, I just want to clarify that I have not read the other books in this series. I think this book was good enough on its own, but without knowing how it would be with the rest of the books, I can't say for certain that it is a series that can be read out of order or individually. This book follows the investigation of is a serial killer who targets women on Tinder dates. While there are some intense moments where we get the story in the killer's POV, most of the story focuses on the investigation side of things and the office politics. There are multiple POVs, all third person and ranging from detectives, doctors, a bartender and the women on the dates. I will tell you right now that if you are looking for a fast-paced psychological thriller, you will not find it with this book. It is a well-crafted story, don't get me wrong, but it is an intentionally slow burn that makes full use of its 500+ pages. And the story isn't really about the murders, it's more about the people trying to solve them. The characters to me were decent, I think in reading the series as a whole and in order I would have developed a greater connection with them. In this book, though, the focus isn't really one character development, by book 11 I think it's assumed to have taken care of by now. I didn't think that took much away from the story; previous relationships were described well enough to see character connections and I'm not sure knowing the full background of every character is necessary for making this a good book because the main plot wasn't really about the police characters. This book definitely had the creepy, terrifying elements down. The murders are very "it could have been me" situations which gave that little bit extra creep factor. I will say that the culprit behind everything was extremely unlikely but at the same time I can totally see it. Throughout the book, we get the POV of the murderer but as things develop, the story shows that it is much more dynamic and twisted than it seemed at first glance. This was my first Nesbø and I can definitely see what all the hype is about. He was able to weave a brilliant story that kept me on the edge of my seat. My only complaint would be the length/pacing of this book. It is a slow-burn, which I was fine with, but by the end of Part Two, I realized that this book wasn't so much about finding the murderer as it was about the investigators. In the end, I see why that was, but while reading it, I found that that was the point where I thought it would be over. Overall, a well-crafted story with an unexpected plot.